Here I ask whether these magnetic effects can be modelled using quantum mechanics. The point of interest here is the ion-pair. Can one get away with simply modelling the di-anion in say a continuum solvent (thf), or is the nearby presence of lithium cations (variously solvated) essential? A negatively charged species, stabilised by continuum solvation (thf). Same as 4, but with one water molecule in the remaining coordination sphere of the Li. Same as 4, but with two MeOMe molecules in the remaining coordination sphere of the Li. Models 4-6 relate to what is called an intimate ion-pair (also a contact ion pair). We are not exploring the solvent-separated variety here. 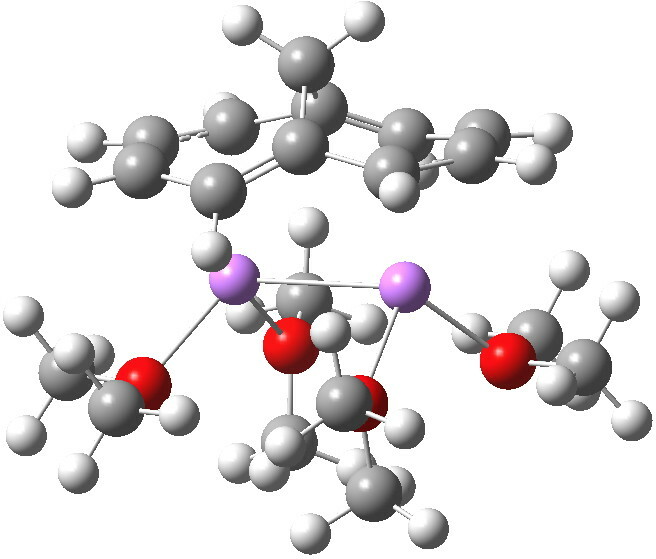 I should also note that whereas the methaneannulene itself has C2v symmetry, the di-anion has the lower C2 symmetry, since the bond lengths are no longer approximately equal, a well known consequence of anti-aromaticity and associated paratropicity. Model 6 is shown below. It corresponds to two allyl anion.lithium cation ion pairs, separated by two localized double bonds. The NMR for 1 and 2 and the models 3-6 is shown below. The shifts computed for the dianion are the average of two equilibrating forms, the barrier to which is fast on the NMR time scale. It would be fair to say that overall, the chemical shifts computed for the ion-pair model are a better fit to the recorded spectra than the purely anionic model. The most realistic ion-pair model, in which the lithium is also coordinated to two (dimethyl) ether oxygens, is a fair, if not perfect fit. Realistically in solution a number of dynamically equilibrating arrangements of the ion pair, possibly solvated by more ethers, or even to the extent of creating a solvent separated ion-pair, probably contribute to the overall Boltzmann populations. The most spectacular effect can be seen on the protons on C-11. For the neutral aromatic annulene, they are strongly shielded by a diatropic ring current. For the anti-aromatic di-anion, they are very strongly deshielded by a paratropic ring current, with Δδ 11-12 ppm. Such two-electron reductions (or oxidation) can yield equally spectacular effects on the NMR of other systems as well, as for example extended porphyrins. This entry was posted on Saturday, October 26th, 2013 at 8:26 am and is filed under Interesting chemistry. You can follow any responses to this entry through the RSS 2.0 feed. You can leave a response, or trackback from your own site. The NMR spectra of methanoannulene and its dianion. The diatropic/paratropic inversion. is licensed by Henry Rzepa under a Creative Commons Attribution-Noncommercial-Share Alike 3.0 United States License.